I'll let you and your classmates figure out this circuit! It is fairly straightforward to analyze. A differential relay is a common type of protective relay used in power systems. 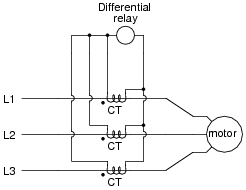 One of the more common forms is the differential current relay. A very common example of a differential current relay - so common, in fact, that nearly every house is equipped with at least one - is the GFCI, or Ground Fault Current Interrupter. Explain what a GFCI is, and then in a larger context, explain what a differential relay protects against. The function of a GFCI is very easy to research, so I'll leave that to you. 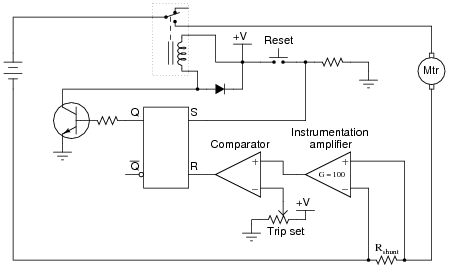 In a more general sense, a differential relay protects against conditions where two or more electrical quantities (usually current) are not in phasor balance. That is, a differential relay will trip when two or more electrical quantities do not precisely balance one another when they should. This question affords students the opportunity to relate something they probably never have had exposure to (a differential protective relay) to something they may see every day (a GFCI-protected power receptacle). The purpose of this comparison, of course, is to give students a familiar context in which to understand something new. Also, explain what this relay will do to protect the circuit if it detects this kind of fault. The differential relay shown protects against ground faults inside the motor. Although not shown in the diagram, the protective relay will actuate a contact that will tell the motor's control circuitry to cut power to the motor in the event of a ground fault. At first, students may be dismayed at the appearance of the current transformers being short-circuited to each other. If so, remind them that it is perfectly normal to short the output of a current transformer. In fact, opening the secondary of a CT can be dangerous! It should be noted that the protective relay itself is but a part of a complete protection system. On its own, it can only monitor for current differences. In order to actually protect anything, it must be tied into the control circuitry supplying power to the motor. That is, just like an overload contact (O.L.) tells a motor contactor to de-energize, the protective relay must command a contactor or a circuit breaker to open in order to actually interrupt power to the faulted section of a circuit. I must say that I am indebted to C. Russell Mason's wonderful text, The Art and Science of Protective Relaying. Not only is it comprehensive, but also very lucid in its presentation.